What is the Feedstock Conversion Interface Consortium and why does it exist? The Why is simple. #1 issue plaguing High and Low Temperature IBR projects is consistent operability of preprocessing and primary deconstruction. In response, researchers have joined together from the National Renewable Energy Laboratory, DOE, Oak Ridge National Lab, Argonne National Lab, Los Alamos National Lab, Sandia National Labs, Idaho National Lab, Pacific Northwest National Lab and Berkeley National Lab to address the problem. The goal? To develop improvements to feedstock supply-preprocessing-conversion processes that enable >90% operational reliability (the probability that the aggregate system will achieve its name-plate throughput, biofuel/bioproductyieldand quality, and minimum fuel selling price targets). 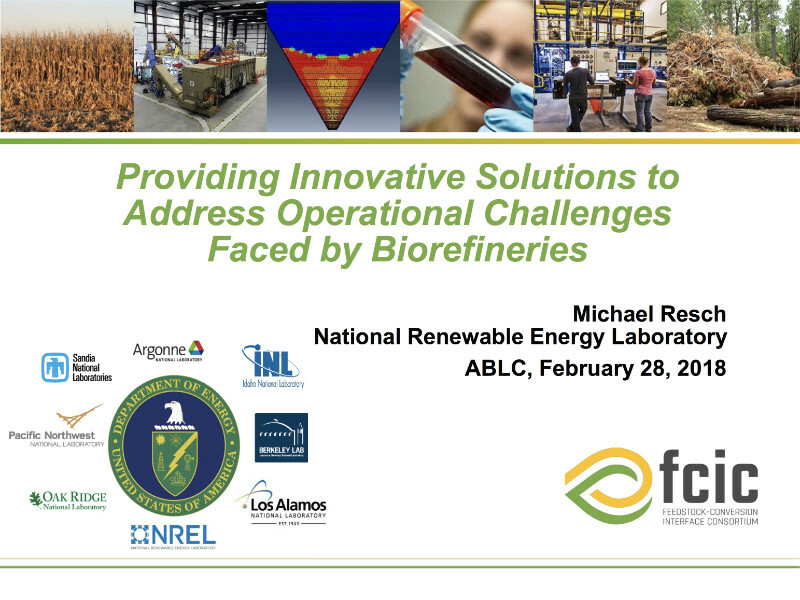 NREL researcher Michael Resch gave this illuminating overview of FCIC’s work at ABLC 2018 in Washington DC.